MOVE Ireland (Men Overcoming Violence), is a voluntary organisation which works to address domestic violence against women. Their overriding goal is to promote the safety and wellbeing of women and their children, who have experienced violence and abuse in their intimate relationships. MOVE provides Domestic Violence Perpetrators Intervention Programmes for men where they are challenged to take responsibility for their abuse and to change their attitudes and behaviour and develop respectful, non-abusive relationships. Taking part in a MOVE programme can make a real difference to the lives of those involved, including children who have been affected. Our member organisation Move Ireland who work to overcome violence against women and children in Ireland, are seeking a female board member to help them run the organisation. The current board has a majority of men and for this reason they are currently only considering expressions of interest from women. If you feel you have the skills and enthusiasm to help steer this organisation’s valuable work please read the information below and you can either contact the organisation directly or you can send Clare PPN an expression of interest as explained below and we will forward it to Move Ireland. Please note this is not a PPN election and Move Ireland will aim to select a candidate that they feel most closely matches their organisation’s needs should one come forward. Please email admin@clareppn.ie with the following information on or before March 3rd 2019. 1.Name, Address and Contact Details. 3. Brief Biography- your work experience, interests, skills and any experience you might have in the areas of domestic violence, counselling, organisational management etc. Should you wish to find out more, you can contact our Chief Executive, Owen O’Neill at 065-6848689 or send us a brief email to move@moveireland.ie outlining your suitability and motivation. If you support this objective, you may be able to help by serving on our Board. Person specification: MOVE Ireland values diversity, and we are committed to drawing Board members from a variety of backgrounds and perspectives. Experience in or knowledge of the community and voluntary sector. Experience in or knowledge of the domestic violence sector. An enquiring mind, with the confidence to challenge constructively. Recognition of the importance of supporting collective decisions. Able to manage a wide variety of situations in a meeting and ensure that the outcomes are in the best interest of the organisation. Commitment to the vision and mission of MOVE Ireland. Six 3-hour Board meetings per year which are usually held during working hours at our Head Office in Ennis, Co. Clare. Training We encourage board members to undertake training as part of their role. This may be general training on governance or on specific to areas that individual board members decide to get more involved in. Training needs are identified on an ad hoc basis, and also through an annual board review process. Benefits of joining the MOVE Ireland Board: As well as contributing towards promoting the safety and well-being of women and their children, this role also offers you an opportunity to engage with a dedicated group of board members, with varied backgrounds and perspectives and a committed staff team and to develop your own skills and expertise for the future. Summary of Role – Member of the Board of Directors: The role involves playing an active role in the governance and strategic direction of the organisation. To provide strategic leadership – periodically review the workings and structure of the organisation to ensure that it continues to work towards its main objective, as outlined in the Articles and Memorandum of MOVE Ireland and ensure that there are strategies and policies in place to support the objective. Promoting responsible and effective management of organisational resources (financial and human). To act with reasonable care and skill and at all times in the best interest of MOVE Ireland. Developing and monitoring risk management strategies. Developing and monitoring internal systems that are transparent and accountable to stakeholders. Communicating with stakeholders and the public. Status:Voluntary role – charity trustees may not profit from carrying out their Board duties. Travel and other reasonable expenses will be reimbursed. Clare County Council has been successful in securing funding for five separate rural regeneration and development projects under the €1 billion Rural Regeneration and Development Fund (RRDF), a key component of Project Ireland 2040. €6.8 million has been secured for projects in Loop Head, Lahinch, Doolin, Kilrush and Holy Island. All RRDF projects applications were prepared and submitted to deliver on the targets of the Clare Rural Development Strategy. This involved collaboration across various Council departments, Municipal Districts, local communities and specific partnerships with Kilrush Amenity Trust and Lahinch Seaworld as stakeholders. Lahinch Seaworld and Town Upgrade Project (€2,860,000): This project is a substantial upgrade of the Lahinch Seaworld community-run facility and associated public realm works in the town. It includes: The retrofitting of the Seaworld building; new public toilets; public realm works; completion of building of new Surf Rescue and Training Centre, Lahinch sports field, new car park and amenity area. Vandeleur Estate, Kilrush (€1,720,000): This project will restore part of the historic Vandeleur Estate, which has been in existence since 1808. The project will respect the existing facilities and buildings within the surrounding area and will include a new museum; and development of arts and crafts facilities to promote local heritage. Loop Head Visitor Attraction (€868,500): This is a significant tourism project which will refurbish and expand the facilities at the historic Loop Head visitor lighthouse attraction with a view to enhancing the capacity and attractiveness of the lighthouse. The project will assist in the enhancement of the existing tourism offering in the area, delivering benefits to the wider community through increased activity. Inis Cealtra Island (€920,500): Clare County Council will develop a detailed design for a visitor centre, a design for a new boat landing point including visitor trails and the production of an interpretation strategy for the island. Doolin Pier: Clare County Council will develop a masterplan to develop a new visitor and tourist Centre at Doolin pier. A separate Clare project has also benefited from funding totalling €666,300. Fáilte Ireland will develop a plan to solve critical congestion and visitor management issues along the Wild Atlantic Way at 15 key locations within the counties of Clare and Kerry. Clare PPN is seeking nominations for three representatives to sit on Clare County Council’s Rural Development Forum. 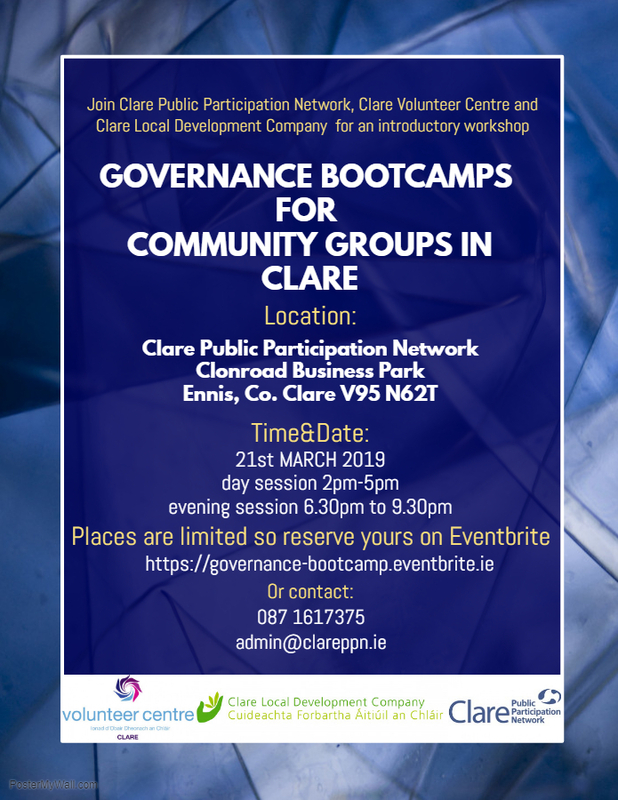 Clare PPN’s representatives on the Rural Development Forum will have the chance to discuss and influence policy decisions, projects and strategies for the development of County Clare and to network with the other 40 members of the forum. We are seeking energetic people for all three roles who are willing to play an active role in both the Rural Development Forum and in consulting and feeding back to Clare PPN’s member groups. All groups who are members of Clare PPN on December 4th 2018 can nominate one person for one of these positions. If you don’t know which ‘College’ your group is in please contact us at admin@clareppn.ie and we will check it for you. Only groups who were members of Clare PPN on 4th December 2018 are eligible to vote in these elections. No individual can represent Clare PPN on more than one external committee or body. Only groups who are members of the particular college can nominate a candidate for that college’s seat. Each member group may nominate one candidate and may then cast one vote in the resultant election should we receive multiple nominations. It is each group’s named contact person’s responsibility to consult with their own members in regard to this. In the event of an election being necessary voting will be open from December 14th – December 21st. The next meeting of the Rural Development Forum is January 15th 2019 and it is our intention to have representatives in place for that meeting. Following the close of nominations, Clare PPN will circulate details of candidates to our eligible members and online voting will be open for seven days.